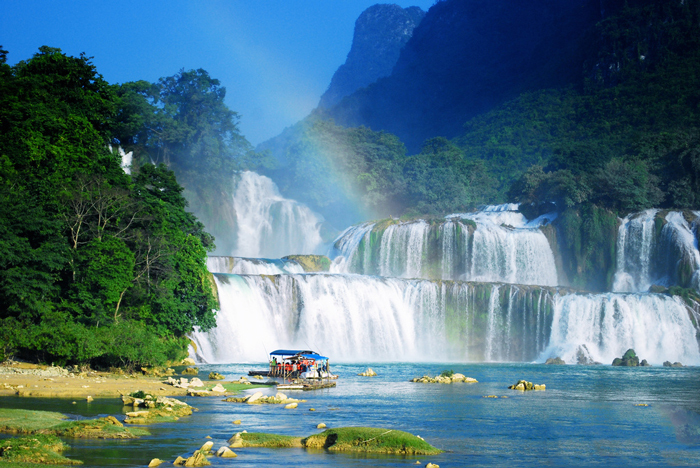 Discover the lakes, rivers, waterfalls and caves in Ba Be national park, and Cao Bang surroundings. This is the most beautiful limestone mountain area in the north east. 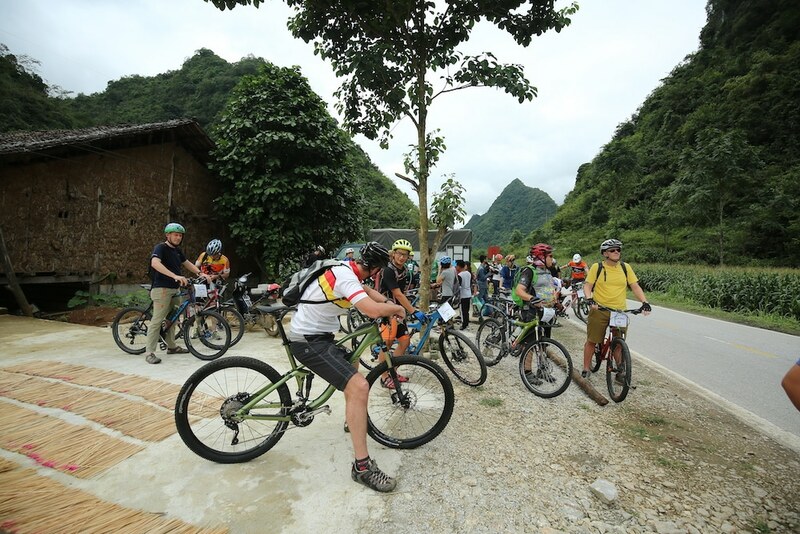 Challenge cycling up and downhill, karst valleys and limestone rocks. Besides being known as a place of culture discovery and a popular trekking and mountain climbing destination, Bac Son Valley is also a heaven for taking photos in beautiful sceneries that consist of rustic villages, rice paddy fields, high mountains, and windy rivers. The crops in Bac Son Valley are grown into many seasons, intertwined at different times. So if you want to admire the colorful paddy fields, you can go to Bac Son at different times of the year. If you want to observe the most amazing golden paddy fields in the ripe season, then you should travel around the end of July or mid-November. Ripe paddy fields are interspersed with green fields and harvesting fields which create a picture of colorful and vivid landscapes that make the valley an unforgettable memory during the harvest season. Visit Bac Son valley in Lang Son Province where is the great combination of the sky, the land, and the mountains. Fill with awesome beauties from the top of the hills and mountains down the valley. Enjoy the rich cuisine of Thai minority people and homestay at stilt house to get new experience. The chance to immerse ourselves in an authentic rural setting typical from Northern Vietnam and influenced by different ethnic groups like the Tay, Kinh or Nung, among others. In the morning, tour guide and driver of Ultimate Odyssey will pick you up from your hotel in Hanoi to start the tour. We transfer 4hours outside Hanoi and have a lunch break in Bac Kan.
Then we cycle off highway 3 to a quiet road, small villages of Tay and Thai on the riverside and scenery of palm trees along the way. Passing Cho Ra little small market then keep on 17km to BaBe. Upon arriving at Ba Be Lake, takea walk around the village where Tay ethnic minority inhabits. This is a great chance to learn more about the unique traditions and customs of the locals here. In this early morning, get up to take in fresh air of the region. 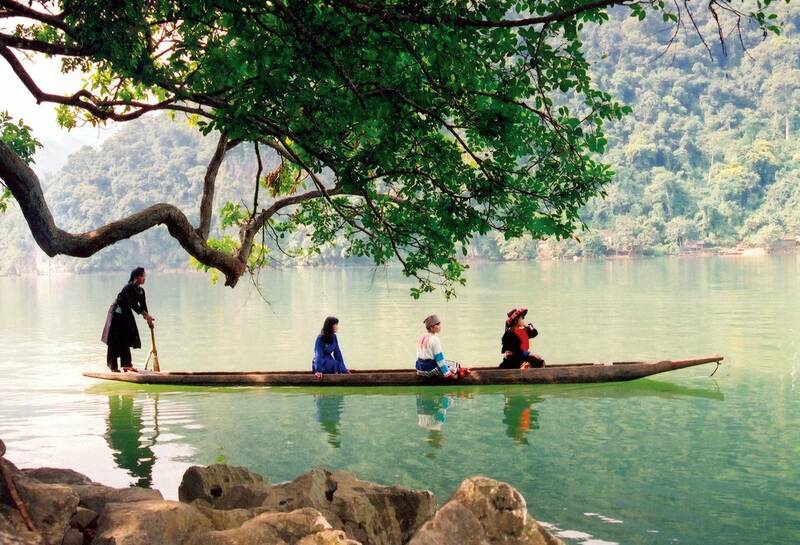 After breakfast, set off your exploration in a local hand-crafted wooden canoe to visit to the lake and Nang River. You cruise through the biggest fresh water lake in Vietnam, visit Dau Dang waterfall - one of the highlights of the lake and Puong Cave- a large cave in Ba Be National Park. Later, we cruise back to Ba Be Lake and jump on on our bike for cycling over some scenic passes on the way and to Pac Ngoi village of Tay tribe. Morning transfer outside Ba Be to Ha Hieu, then we ride on village road 60 km to Nguyen Binh. Challenge climb up Phia Oac/Phia Den mountain pass at level of +1,200 m. Picnic lunch en route. In the afternoon, we cycle on paved road to Nguyen Binh where our minivan pick us up for transfer to Cao Bang. This morning, after breakfast at the hotel, our car will transfer us out of the highway and start cycling on pave road village road to the remote area of Trung Khanh District. Along the way, make a short stop at Phuc Sen village where you have chance to get to know more about the techniques of making farming tools used by local blacksmiths. At around 11.30, you will arrive at the waterfall. Take a short walk down to Quay Son River and embark on a small local boat to explore Ban Gioc waterfall. Ban Gioc is the fourth largest waterfall in the world that is situated on a border between two nations, Vietnam and China. It’s also the most majestic and beautiful waterfall in Vietnam. It is more than 30 meters tall and it flows through many layers of limestone. Afterwards, transfer to the nearby local restaurant for lunch. Your afternoon exploration will continue with a visit to Nguom Ngao Cave- famous for its unusual limestone formations. You will be fascinated by the breathtaking charm of stalagmites and stalactites. Nguom Ngao Cave was discovered by local people in 1921. This cave is classified as the most beautiful cave in Vietnam. The system of stalactites and stalagmites has created an extremely magnificent and interesting scene. After sometime exploring the cave, get on our minivan and drive back to Cao Bang. After breakfast, bid Cao Bang farewell and begin cycling about 50KMS to the border town of Lang Son, a settlement booming with trade. Have lunch enroute. Afternoon that our minivan will transfer us to Bac Son Valley. Take a short stroll around the village to get a closer look at the lifestyle of Tay people. Afterwards, you will be transferred to the famous mountain of the region - Nay Lay Mountain. You will climb from the foot to the top of the hill where there is a cell phone tower. Here, after a hard journey, you will see the beauty of Bac Son gifted from Mother Nature. It is hard to resist the allure of the blazing sun, the vast rice fields, and the seemingly reachable sky. You will have plenty of time to save this moment for yourself and enjoy to your heart’s content. This is a great point for those who love photographing. Afterward, you will return to the local house and regain your energy by having a delicious dinner made by the host family. After that, you may choose to rest for the night or to complete your curiosity about Tay people by talking with the host. After having a traditional breakfast, time for us to visit another village in the region on a 3-hour biking trip. Along the way, you will experience the peaceful land of Bac Son, the fresh air of the mountainous area and the nice breezes blew on the way. Moreover, there will be a lot of traditional houses, mountains and forests await you on the trip. Stop at the banyan tree, which marks the traditional architecture style of the old village in Vietnam, visit Nong Luc temple, an epitome of Vietnam traditional communal house. This place is not only a culture site but also a historical one since the temple is the meeting place to launch the Bac Son revolutionary campaign on September 27th, 1940. Then, you will bike back to the homestay to have last meal with the host. After that, it is time to say goodbye to our generous host. Our minivan will transfer you back to Hanoi. Around 17:00 you will arrive in Hanoi and the odyssey ends here. If you wish to extend more cycling days or go to Halong bay to enjoy a cruise trip, please contact us then we can arrange for you at additional cost. Private air-conditioned vehicle for transfer and back up as itinerary. The back road along village is small but good enough for cycling, less busy. Experienced English speaking-biking guides who is enthusiastic, friendly, knowledgeable and helpful. Biking guides are first aid qualified and can maintain bikes. Their role is to deliver a safe and enjoyable trip to customers. They lead and care for the group, co-ordinate the driver and support vehicle, buy snacks and fruit along the way, look out for customers needs. Groups below 7 will be led by our local guide. Groups of 8 or more: A Cycling Tour Leader, plus cycling assistants and drivers. Enjoy your riding speed from 10km per hour up to as many more as you can (40km/day or 70km/day or 100km/day).